Very slowly, I am acquiring the language of sailing. And, it really is slow going right now. But, my husband called me from Barbados today, and, after a quick google search, I learned the word, ‘hiking’. Hiking is a nautical term that means to “hold oneself outboard on the windward side of a heeling sail boat to reduce the amount of heel.” (Dictionary.com) Or, in layman’s terms: the Skipper sometimes has people sit on the high side of the boat because it makes the boat go faster. 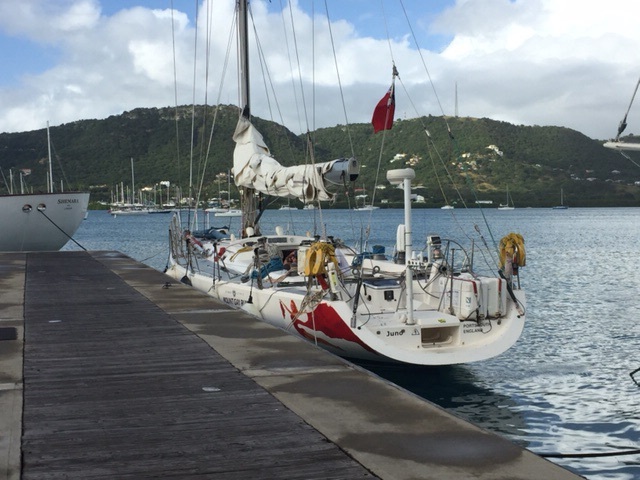 This is a picture of the boat that my husband is sailing, training, sleeping and hiking on this week. He is doing the Mount Gay Rum Round Race 2015 with Ondeck sailing. The boat is a 65 Farr. Here is a link to a far sexier picture of the same model of boat. In this picture, the people sitting on the high side of the boat are ‘hiking’. It’s a great photo – click on it, but be sure to come back. Given this great action shot, it puzzles me why Ken Read would write: “It’s not as though hiking is cool or even remotely attractive.” (Sailing World, Less Hiking, More Stacking). Maybe Read and I have different priorities. Isn’t hiking sort of social? And, isn’t hanging out for the ride kind of fun? I think I’d like it best at night, when the water is like ink and the stars are big and bright. Many kinds of racing keelboat are raced with more crew aboard than is strictly necessary to operate the boat in order to increase the amount of weight on the upwind side of the boat, keeping the boat flatter. My husband says that, on his boat, they have separated into two groups of four. He works a 4-hour shift with his group and sleeps between shifts. Then, the other group of four take over. He says that changing the sails is a lot of work, and it has to be done frequently to take best advantage of the wind. Ken Read says hiking is the “least exciting” part of sail racing. I’ll have to find this out for myself when I go to Antigua for sailing training. To me, feeling the wind in my hair, and just enjoying the ride sounds fantastic.